Nestled in the scenic Dogpound Creek valley, we offer a licensed clubhouse and snack bar, driving range, practice green and 18 holes of pure golf enjoyment. 2019 Tournament and Group Bookings Welcome! 2019 Memberships available now! Visit our membership page to contact us. Reserve your group golf event now! Tooth of the Dogpound Creek Golf Course is nestled in the Dogpound Creek valley and is complimented by mature trees and foliage. There are wide fairways with a number of doglegs. Natural hazards include trees, natural foliage, and the Dogpound Creek. Some manmade sand bunkers add another hazard for golfers to avoid. Our bent grass greens are in excellent condition. Superintendent Brandon Odell has received many compliments for his attention to detail when it comes to turf management. Our Ninth Hole does not join up with the clubhouse and because of this patrons can play 12 holes for the price of 9. Our rates are very affordable and we offer a discount on Tuesdays. We also have a practice putting green and driving range in operation. 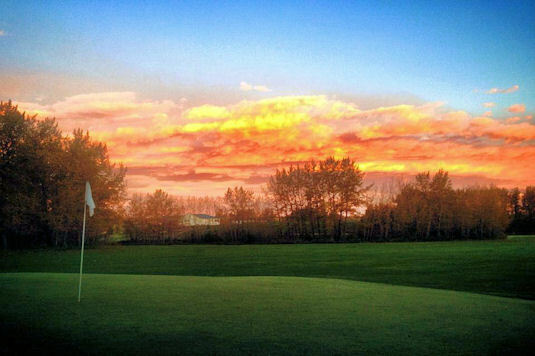 The natural beauty and countryside views at our golf course are spectacular. Our signature hole 8, named “Devil’s Head”, overlooks the surrounding countryside, and on a clear day one can see its namesake ”Devils Head Mountain” in the foothills of the Rocky Mountains. The fresh country air and sweet melodies from an array of birds is captivating.